This alluring muse gracefully turns her head to the left, exposing a seductive neck and tender pink earlobe. Transparent gauze covers her shoulders. Rosalba Carriera rendered the porcelain skin, flushed cheeks, and wavy hair with subtly blended pastel colors, creating a soft, velvety surface. The intense contrast between the ivory flesh and dark background imbues the divine creature with radiance. 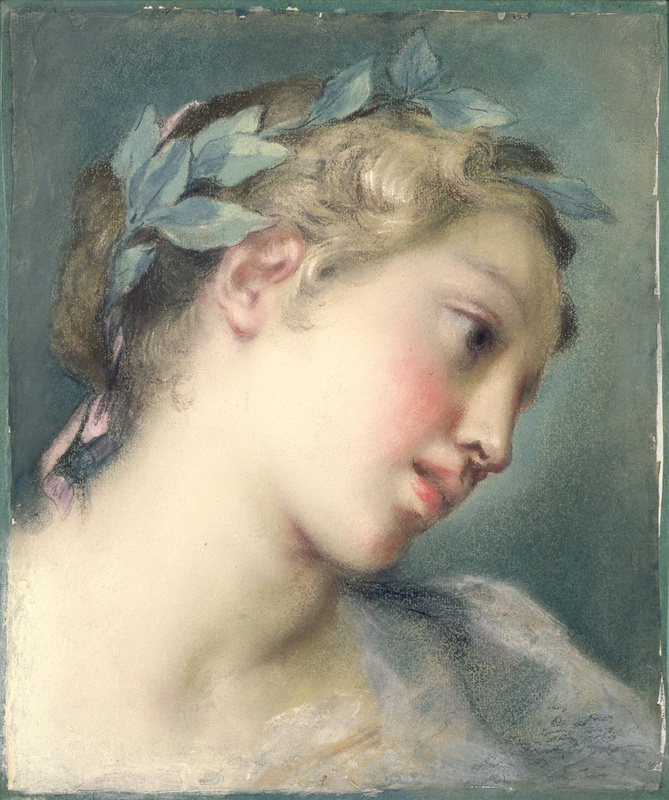 This delicate head crowned by soft curls and an ivy wreath was one of many idealized images Carriera made called teste di fantasia --a kind of fanciful rendering of a beautiful woman with a mythological or allegorical appearance. Celebrated throughout Europe for her mastery of pastel, Carriera likely created this image for Augustus III, Elector of Saxony and King of Poland. Source: Henning, Andreas. "Rosalba Carriera e la collezione dei suoi pastelli a Dresda." In Rosalba Carriera, 1673-1757. Atti del Convegno Internazionale di Studi 26-28 aprile 2007, Venezia, Fondazione Giorgio Cini (Verona: Scripta, 2007), p. 341.